Having always had a passing interest in Sons & Daughters but neglected to own any of their previous three outings, I can't offer a premeditated view of their new long player. Mirror Mirror is a roundhouse of stark, bleak minimalism in guitar and electronic pulses. Opening track 'Silver Spell' confirms this with its regimental primitive one-beat drum pattern and sparse synth sound. Scott Paterson's and Adele Bethel's beastly haunting vocals are showcased with the repetition of the vocal. It's reminiscent of The Human League's 'Being Boiled' era. 'The Model' picks parts off Siouxsie's Banshees and is a cleverly arranged ditty. The rat-a-tat keys and the funk bass of 'Breaking Fun' demonstrate a clever use of space and confidence in the band's own ability to mix it up. 'Orion' is a plethora of cowbells and jutting guitar bashing against Adele's 'I Sang to Orion' vocal. Patterson morbidly butts in as and when he feels like it and his contribution is sparse but profound. 'Don't Look Now' has a definite sound of Gang of Four about it. Its urgent, sharp bass and the gothic overtones are pretty obvious throughout but they've got the mix absolutely right, while Patterson's reverb laden guitar lingers in the background against the taut bass and stripped naked drums. 'Ink Free' is a rather creepy affair with the sound of a typewriter wrestling for attention against a one-note bass-heavy synth note. Bethel and Paterson chip in with some fine noir vocals which recall the sound of The Kills but with the emphasis on the dirt of dirty blues. It builds and builds until the fried synth can't take anymore and simply keels over. 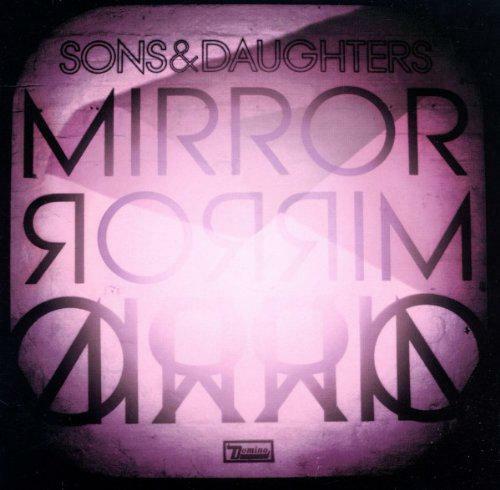 With Mirror Mirror, Sons & Daughters are able to fluctuate their sound between indie guitar and a mix of synths. It's almost bi-polar at times but the variation merely adds to the enjoyment the 10 tracks offer. There is a distinct feeling of togetherness on the album and, to be quite frank, it shows in the catchiness throughout. 'Rose Red' couldn't be further from opener 'Silver Spell' with its driving bass all closed off by a squall of velvet underground guitar. 'Bee Song' has a funereal finish about it and Adele's hanging vocal sends shivers juxtaposed against a Duane Eddy style guitar drawl. 'The Beach' rounds off the album effortlessly with its pitter-patter raindrop opening and church-like vocal haunt. The bass throbs and the echo-laden vocal of Paterson bridges the gap succinctly until the raindrops return. Take this on face value, wipe away your previous S & D listens and give it enough time and you'll be enraptured by the beauty of this marvellously dark and mysterious album.